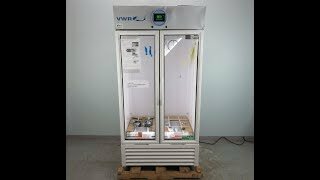 The VWR Series Glass Door Lab Refrigerator offers adjustable cooling and large capacity storage, with the convenience of quick inventory sight check. This unique lab refrigerator features energy efficient and environmentally friendly non-CFC, hydrocarbon coolant, partnered with forced air directional cooling, an oversized evaporator and bottom mounted condenser for excellent uniformity throughout. This 35-cu ft laboratory refrigerator has plenty of storage capacity, with adjustable shelving and an easy to clean, brightly lit interior, and dual pane insulated glass doors that let users check on sample and consumable levels at a glance. The VWR series refrigerator is digitally controlled and features an independent monitoring and alarm system to alert users to deviations from high and low set points, or if there is a sensor error or power failure. This 4°C lab fridge is a great choice for critical samples thanks to the precise temperature control and digital accuracy, as well as a real time sample simulated temperature probe. This is a brand new scratch & dent unit tested by our service team with a clean bill of health as per our QC process. This VWR 4°C Lab Refrigerator Dual Glass Door CAT# 10819-578 is a brand new scratch & dent unit, with pictured blemishes, and tested by our service team with a clean bill of health as per our QC process. All of our lab equipment comes backed with our standard warranty. Should you have any questions about this or an of our other lab refrigerators, please don't hesitate to contact us.